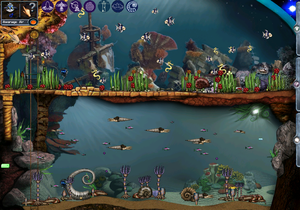 Past Seas is a small, two-level aquatic metaroom that was created by Grendel Man and Nirax. The room is largely based on the oceans from Creatures 1 and 2, hence the name "Past" Seas. As such, it features animal life from both of the aforementioned games, as well as several critters and plants unique to the room based on animals from Earth's distant past. Grendel Man originally planned to have the metaroom released by the CCSF 2010, but then missed the deadline. The room was finally completed in time for the CCSF 2011, where it was released. The promotional banner for Past Seas. This page was last modified on 30 December 2014, at 22:11.